Home > NyiRoRo Kidul Khodamic Mystical Gem Stone Attraction Love Wealth Talisman Amulet. We are excited to bring to you these latest batch of extracted items, which we have been in search of for a long time. Stories abound on this vastly powerful spirit or deity that dwells in the Southern Sea of Java. There are many stories that surround this deity. We will relate to you the story that was told to us by the extractors group. 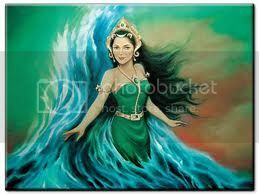 Nyiroro Kidul is the chief of a realm in the Southern Sea of Java. She was known during her lifetime to be a princess that had extraordinary charm and was able to charm anyone with her words and beauty. She was kidnapped by pirates and disappeared. She has been known to appear in various forms as a mermaid of sorts. Those that have had contact with her say that she has been known to be able to change shapes. Some believe that her story can be traced back to pre-Hindu-Buddhist times. Whatever it is she is renown and her story has been passed down from generation to generation. Nyiroro Kidul's room at Samundra Beach Resort, Southen Jawa. Yes a room was dedicated to the deity at the hotel. - Excellent for businessman, business owners, those involved in sales, helps to attract customers. - Improves the appearance of its wearer provides long lasting young appearance throughout ones life. - Excellent in matters of attraction, love and interpersonal relationships. This is a powerful item and we recommend those who have some experience in dealing with items as such to rent this item. This item should be treated with the utmost respect as any khodamic item. Guide book and dzikir process booklet will be provided upon request. Approximate width 1 cm length 1.5 cm. Pls check with us for stock availability before purchase. a) Pls. note in regards to Khodamic items, it is our responsibility to ensure that these Khodamic items find their rightful home and are with people who appreciate their latent powers and are able to care for them correctly. b) Talisman requires time to take effect on a person’s life. They also take time to connect with the user. If you’re expecting instant results than you must have been mistaken. There is no quick fix. c) A bond / relationship need to be built between the owner & the Khodam over time. d) Guidance booklet will be provided to all upon request. For those who are Muslims or practice Islam you can ask for the dzikir booklet as well. d) From our experience in selling and dealing with Khodamic talismans we have had clients, who are able to experience, feel & see certain things with Khodamic talismans and some people are not able to feel or see anything at all. This dependent mainly on the person’s psychic level, sensitivity to the unseen world. We have had many clients who have been able to experience various feelings and sightings. e) If you are looking to make a particular purchase and need some advise on Khodamic items, you’re welcome to email us for advise on that particular item you’re looking to purchase.